Recently Greg emailed the following question about spurs: “Why would a Natural Horseman need such a cruel aid? ?” Greg gets triple his money’s worth because I’m going to treat this as three questions instead of one. First, are spurs cruel? Well, the simple answer is no. Spurs are tools and the effect they produce is entirely in the hands – or, in this case, feet – of the user. A more complex way of looking at this is to consider their potential for misuse. The rider who becomes angry or frustrated or embarrassed may use spurring as a convenient way of punishing the horse. This is where the effect becomes cruel because the horse feels under attack; an even-tempered rider might arrive incrementally at a similar amount of pressure and never produce the mental state that goes with cruelty. So, maybe a better answer to the question is … it depends. Second, why use spurs? Clarity, pure and simple. Without spurs, you still have numerous aids available to you: seat, legs, hands. Even weight, voice, and the picture you’re holding in your mind could be considered aids in communicating your wishes to the horse. But with the spur, you have precision. It’s like you’re saying to the horse, “Move THIS part of your body away from the pressure you’re feeling.” It’s a very specific request. 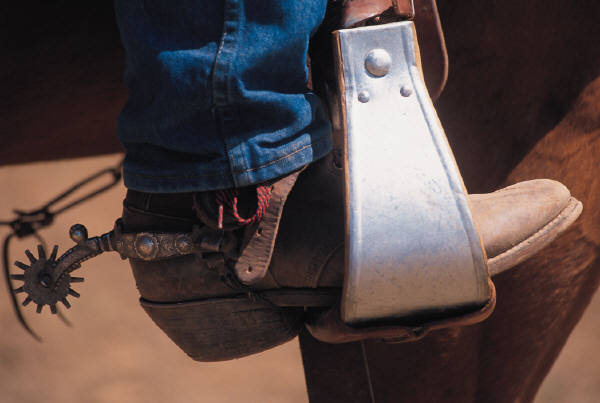 Incidentally, spurs are most useful for 1) lateral (sideways) movement of some body part, and 2) collection, which means elevating the back, getting the hindquarters more underneath the horse, and lightening the front end. Note that I’ve said nothing about spurring to get a horse to go faster. Horses can learn to go faster when spurred but it’s an unnatural way to ask for speed since moving away from the pressure causes the horse's back to elevate and stride to shorten. Third, how do spurs fit into natural horsemanship? The natural horseman is committed to working with the nature of the horse and communicating in ways the horse instinctively understands. If you do this, you’re a natural horseman whether you call yourself that or not. Horses understand and respect pressure exerted by a more dominant horse. It doesn’t scare them even when it makes them uncomfortable. Natural horsemen use this knowledge in all they do. A rider using the same level of pressure emotionally or without regard to the horse’s nature triggers a very different reaction, which is not only cruel but dangerous and counterproductive, as well. I would sum it all up like this: Spurs are useful and humane tools when used by riders committed to the principles of natural horsemanship, whether they embrace the term or not. For everyone else, spurs are not appropriate. My hope is that the “everyone else” group is shrinking all the time. My hope is that one day we can drop the adjective “natural” and just talk about horsemanship. We’re not there yet, though. The distinction is still important.